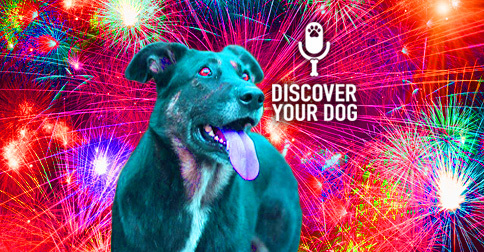 Ep 092 Dogs, Fireworks, and Things that Go BOOM! When your dog freaks out about loud noises, it can cause a commotion! Today, discover how to desensitize your dog to surprisingly loud sounds. In this episode, you will learn what you are doing to reinforce your dog’s overreactions. 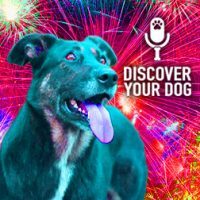 This episode is specifically about the fear in your dog about storms or loud noises and how it affects your training. It’s not about the dog being afraid of the owner. Communication of your reaction during a stressful time from you the owner to your dog is key! Fear of storms and loud noises is a reactive type of fear. Be mindful of how you, the dog lover, may be reinforcing these behaviors and not fixing them. It comes down to you being aware during these situations, and that you recognize your emotional response to your dog. Responding to your dog’s fear by trying to calm them down and pet them, you are actually reinforcing to your dog that they are supposed to be acting this way. These characteristics plus your dog’s age and the duration of this behavior should be taken into consideration. The goal is to become very aware of where your dog is in the larger picture and how you are reacting to their behavior. If you have an older dog that you have adopted and are unaware of how long the behavior has been reinforced, it can be harder to break them of the fearful habit and get them to adapt. If you have a highly trainable dog, it will be easier for you to work with them. If you have a skittish dog to begin with, it may be harder to work on this behavior in the long run. If you have a friendly dog and very trainable dog who adapts well to situations – which are most dogs – this will be much easier to handle. In Ep 091 – there are some behaviors that CAN be ignored, and this episode can be a good tool to reference for working through this fear. In Ep 038 – how you can desensitize your dog from certain things such as noises—this would be helpful to work on throughout the process. Keeping in mind a “safe place” for your dog is a good tool that can be used during this process as well. What reactive behavior is and how your dog is learning – this is a self-discovery process! This week’s homework is designed for you to recognize your reactions in the moment – think of it as an awareness-building type of exercise. You have instantaneous reactions all the time without even realizing it until after the fact. Your dog LIVES this life – without the ability to analyze afterward. They only remember the BIG reaction or BIG emotion that is related. When you see that your dog shows fear of something over and over again, it is because of this BIG emotion or BIG reaction that is related to that moment. Set this up with a spouse or friend at least a week ahead of time. You need to ask your friend to scare you three times in the week – jump out at you or do something in a way to make you feel uncomfortable in a moment’s notice and discuss with your friend how it makes you both feel. Second part—Once you have been startled, assess your immediate reaction. Then notice how you had the ability to change your instant reaction? Now, think about if you didn’t have the ability to do so? What if you had to keep that instant reaction for a long time and didn’t know why or what was causing you to feel this way? This is how your dog responds to loud noises! How you respond to your dog in the moment is how your dog will learn to react. If you are able to ignore her, let her go through her emotions and you have created a good bond, you give her the possibility to learn that the noise is not a threat because you showed no reaction. You may even be able to teach her to ignore that noise and trust you. You may also do a loving correction by simply stating “No”. However, this correction needs to be done in a non-harsh and trusting way.